Arcus Automation Private Limited industrial handheld barcode readers provide unmatched performance for Direct Part Marks (DPM) and label-based applications, where integration, ruggedness and the ability to read challenging marks quickly are essential to your success. DataMan industrial handheld readers have field interchangeable communication modules. One reader can be configured to meet specific communication needs. The DataMan 8070 series, including direct part mark (DPM) and extended-range models, provides powerful barcode reading performance for challenging DPM and label-based code applications on the widest variety of surfaces and marking methods. Featuring the latest patented technology, advanced lighting options, and modular communications, the DataMan 8070 series is ideal for automotive, aerospace, medical device, and logistics industry applications. DataMan® 8050 barcode readers bring Cognex’s patented algorithms to anew, lightweight industrial handheld platform. DataMan 8050 reads 1D and2D barcodes with incredible speed every time even if damaged, smudged,scuffed or poorly marked.Modular design easily adapts to meet your needsField interchangeable communication modules allow one reader to beconfigured to meet specific communication needs to support corded RS-232, USB, and Ethernet options, as well as cordless options includingBluetooth and Wi-Fi.Rugged industrial designThe DataMan 8050 barcode reader is constructed to handle the harshestenvironments. Other industrial features include: lanyard hook for easyretractor mounting, bright centralized aimer for clear targeting, loud beeper,and indicator lights. Proven performanceThe DataMan 8050 readers are ideal for applicationsin any manufacturing environment that require robustbarcode technology and reliable reading performance:¿¿¿¿¿¿ Automotive body and assembly¿¿¿¿¿¿ Electronics manufacturing¿¿¿¿¿¿ Incoming inspection¿¿¿¿¿¿ Shipping¿¿¿¿¿¿ Automotive kitting¿¿¿¿¿¿ Aerospace¿¿¿¿¿¿ Packaging¿¿¿¿¿¿ ReceivingTo learn more about Cognex handheld barcode readers, visit www.cognex.com/handheldHigh speed 1D/2D reading performance¿¿¿¿¿¿ Cognex’s patented algorithms, 1DMax® with HotBars,® enables the DataMan 8050 barcode reader to decode themost challenging 1D barcodes quickly and easily, at more angles and in any orientation.¿¿¿¿¿¿ Class-leading 2D algorithms read many 2D symbologies even when damaged, obstructed or with perspective distortion.Supported 2D symbologies include: Data Matrix, QR, PDF417, MaxiCode, and Aztec.¿¿¿¿¿¿ Best-in-class reading performance means 8050 reads damaged, plastic wrapped, direct inkjet, low contrast, poorlyprinted, scraped, obstructed, uneven, torn, small, and smudged barcodes. 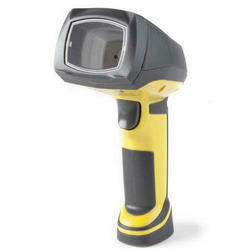 Looking for Handheld Barcode Scanners ?